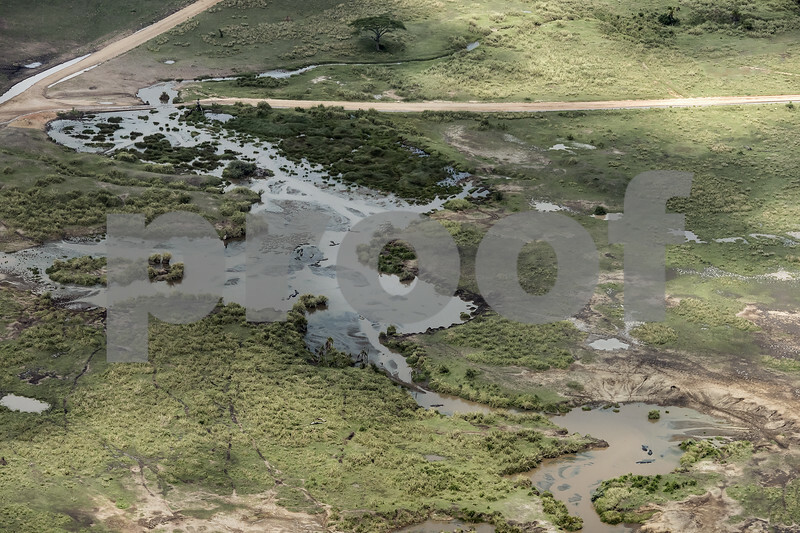 This image, taken from the air, must be seen at the largest size to appreciate the dozens of hippos semi-submerged during the day in a large natural river pool. Taken near the Seronera airstrip, Serengeti, Tanzania. The aerial shot presents quite a different perspective on the natural tendency of hippos to congregate together in the water to stay cool during the day; it was quite exciting to spot them from the air. Certainly more than a few hippos down there ! Would make it easier to find them later, on terra firma ! Outstanding - Lucky you with this great aerial photo! Super capture. Glad you pointed out what to look for. What a great POV, and yes you are right in larger sizes its amazing to see how many hippos there are. This is wonderful Terry! A unique view & well captured.